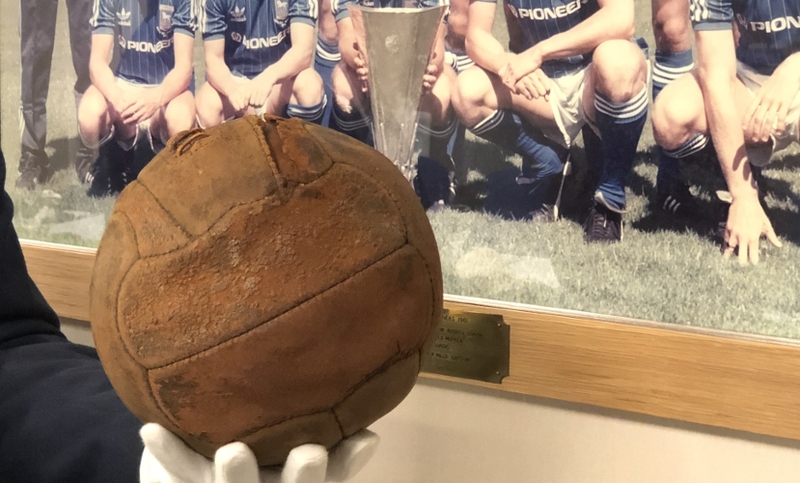 The Football of Loos, which was kicked between soldiers of the London Irish Rifles during a Great War battle, will be at Portman Road on Saturday as Town mark Remembrance Day ahead of the game against Preston North End. At the time of the Great War football was actively encouraged among troops for fitness, competition and to build camaraderie and it was not uncommon for soldiers to carry balls with them. But before the Battle of Loos in France on the Western Front in September 1915 the high command, after hearing rumours of footballs featuring in the forthcoming assault, ordered that they all be confiscated and destroyed. However, Rifleman Frank Edwards of the London Irish Rifles kept a deflated ball down his uniform front and just before the whistle was blown he blew it up and as the command came hurled it over the top to the call of “Play on the London Irish!”. The ball was kicked between Edwards and his team-mates Micky Mileham, Bill Taylor and Jimmy Dalby as they advanced and even when the the line was halted, to keep in contact with units to their left and right, the ball was kept in play. The London Irish assaulted the German trenches, cleared through three lines and won the day. They held the line for three days before being relieved. The endeavour was made that much harder as the men were wearing respirator hoods as the British had deployed gas as part of the assault. The gas had stalled as the wind had faded and the soldiers had to fight through it. Edwards was wounded in the thigh and was aided by Mileham, who in turn was wounded while attending to him. However, they both made it to the regimental aid station and survived the war. The ball itself was recovered from the German wire and is now kept at the Regimental Museum at the headquarters of the London Irish Rifles, Flodden Road, Camberwell, London. Colchester-based Town season ticket holder Tony Robinson (pictured), a former corporal in the London Irish, looks after the ball when it is taken to events in the role of Ball Major and has appeared with it on TV on a number of occasions. 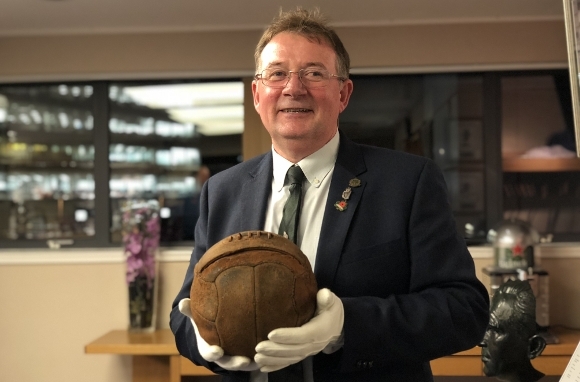 “The ball will be in the FanZone for supporters to have an opportunity to view this unique Great War artefact which has featured on the Antiques Road Show and QI, “Robinson told TWTD. “The ball is supported by donations, which will be welcomed on Saturday. “The ball represents teamwork. In the military the individual is an essential part of a team which is working in life and death situations. As in football the roles performed by each player are essential to winning the game, the same applies that even in the biggest battle the role of a single soldier can win or lose the day. The ball will be in the FanZone from midday on Saturday - where donations can be made to the London Irish Regimental Museum - and subsequently will form part of the club’s on-pitch Remembrance Day commemorations prior to kick-off, while London Irish Regimental Association chairman Peter Lough will be interviewed on the pitch at half-time. What a great honour for our club to have this at the ground for our closest game to Remberance Day. I will certainly go to the fanzone with my 13yo son and make a.donation. Well done to whoever organised this.